Gary Pollock, the Executive Director of the Northwest Center Foundation, spoke about the Foundation’s purpose and goals, which are primarily aimed towards developmentally challenged children and adults. Jacob Peltier talked about the Eastside Roteract Club for young professionals. Wendy Wendelin has joined us from Finland as this year’s BBRC Exchange Student. Brian Evison introduced Gary Pollock, the Executive Director of the Northwest Center Foundation. Gary spoke about the Foundation’s purpose and goals, which are primarily aimed towards developmentally challenged children and adults. 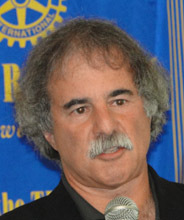 Gary is a member of the Seattle-4 Rotary Club, as well as the Bellevue Chamber of Commerce. Gary has devoted his career to non-profits, and he focused on the number of great people he has interacted with and the considerable effect the Northwest Center Foundation has had. The Northwest Center is likely best known for its “Big Blue Truck”, which picks up lightly used clothes. They also offer a variety of services, businesses, and programs, each of which demonstrates the value that emerges when people of all abilities engage with each other in work, learning, and life. Other programs include Document Storage and Shredding, legacy giving, and Commercial Laundry. The businesses include catering, laundry, janitorial, and related services. When Northwest Center was founded in 1965, many mothers could not get children with developmental disabilities into school. The Center’s vision is that “Inclusion is not a Compromise”, and that healthy societies rely on persons of all abilities. The Queen Anne and Downtown regions serve over 500 families. All children grow and develop, and if you challenge children, amazing things happen. Northwest Center is focused on integrating developmentally challenged children into meaningful careers. The School to Work program, for example, works with high school students. While decades ago, developmental challenged individuals were limited to such menial tasks as “sorting bolts”, they can accomplish much more than that. Northwest Center Foundation competes effectively with for profit organizations. Northwest Center Kids provides inclusive care and services to infants, children, and teens with and without developmental disabilities through a blend of education, early intervention, and childcare including before/ after school care, teen programs, and summer camps. Northwest Center employment Services assists adults through a wide spectrum of services, including job training, placement, and on-site support. There is a direct connection between Northwest Center and public schools, up to the high school level. The Foundation runs quality-based programs. A key element of non-profits is the coordination between profit-based companies and non-profits. When children of all abilities learn in an atmosphere of inclusion, they learn skills that bring out their best qualities. Companies and organizations with a diverse and inclusive workforce experience higher sales, greater productivity, and improved morale. Northwest Center can be supported by donating to the Big Blue Truck, volunteering, doing business with Northwest Center, hiring clients, and attending a sponsored event. Northwest Center can be reached at 206-285-9140, and their web site at www.nwcenter.org. They are located at 7272 W. Marginal Way South, Seattle, WA. Girish Bhatia gave the Introduction, in which he described the similarities between Rotary and the Olympics. Both provide the most rewards for participation as well as lead to drive for excellence. Both the Olympics and Rotary are powered by people. This drive toward excellence that is characteristic of the Olympics and Rotary tends to make ourselves, families, and the community proud. Steve Waltar introduced visiting guests and Rotarians. Jacob Peltier, the President of East Side Roteract Club, described their revitalization plan. The Roteract Club, made of young professionals, participates in events such as First Harvest, organizes their web pages, and focuses on a number of projects such as Thanksgiving Dinner for the homeless. The East Side Roteract club also pairs with returning vets that have disabilities (such as PTSS). Roteract club is seeking good members that might be referred to them from the BBRC. BBRC is hosting a foreign exchange student from Finland for the school year. The student will be attending Bellevue High School, and is very interested in learning about U.S. culture. Members who want to ask the student to join them on their activities are encouraged to contact Morris Kremen. Peter Hidano, who has been our greeter at BBRC, is leaving and has a position set up at the Overlake Safeway. Peter has shown himself to be hardworking and cheerful. He will be missed. On September 7, the new Rotary District Governor Lingenbrink (a BBRC member), will provide a presentation on the District Rotary Organization. On September 14, Washington State Gubernatorial Candidate Jay Inslee will be at the BBRC, where he will describe the campaign and the election. This is becoming a close election and the BBRC has offered the Republican Candidate Rob McKenna an opportunity to speak (two spots open in October). On September 21, the BBRC meeting will be at the Issaquah Salmon Hatchery. The salmon are now running at the hatchery. Some cause happiness wherever they go, some cause happiness whenever they go.